July in Yorkshire – and a giveaway winner! You may remember a post a while back – April I think when I commented that it was very warm and sunny – warmer than we usually get in April in Yorkshire or even July in Yorkshire, well this was one of those weekends that proved my point.It has been very, very wet for virtually all the weekend. 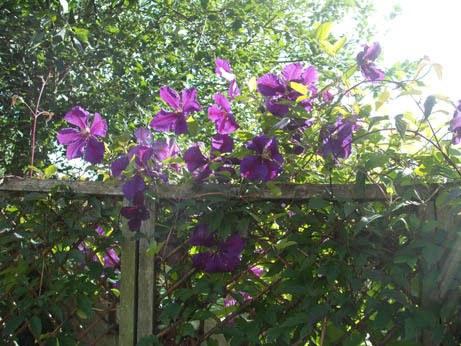 So no garden fettling but I did manage to get a pic of my lovely new clematis blooms during a bit of sun yesterday. Poor Ellie has been very rained on during her dig – she is down south at the moment doing an archaeological dig at some standing stones as part of her course. She can cope fine with the rain (it’s just like most of the family holidays we have after all!) but unfortunately her lovely new Zandra Rhodes tepee tent that I bought her for Xmas has on its first trip out proved to be not waterproof at all! They have been very flooded so she has had to retreat to her little tent and we will have to be sending that back to the suppliers with a little note when she returns! Apart from that she is enjoying herself and they are hoping for better weather next week. We need to wish Becky, her friend and future housemate who is also on the dig with her a belated happy birthday, it was her 21st birthday this week so a very, very happy birthday Becky and I hope that you and Gemma liked the pressies Ellie made you and that you liked the sparkly elephant that starred in last month’s Scavenger Hunt. 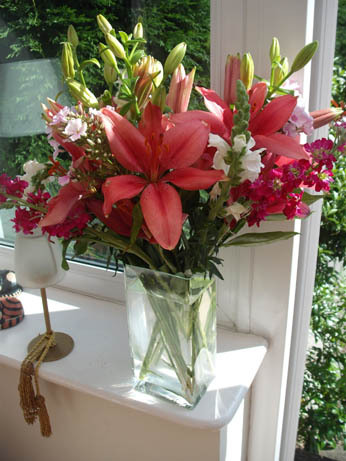 Becky and her boyfriend Chris have just come back from staying in our house in Spain and they sent me a very wonderful bouquet of flowers to say thanks and a fab card that she got from Moonpig which had loads of their holiday snaps on it – what a brill idea! Thank you very much Becky and Chris, you are most welcome! Look at these lovely blooms – I don’t know what the little multi-flowered ones are but they are so pretty and I love lilies. I have had a very busy week again including trying to sort out more IT issues (Jacob’s new birthday computer 0 restored wireless network 1) so some success on that front, bizarrely it will connect fine when downstairs but not when in his room, despite the fact that my laptop will – humm! And 2 hours on the phone with technical support could not fix it – it is a good job that I am a woman who knows my ping from my command prompt I tell you! However he is very happy as he has a super new graphics card and all is very pretty and the games work well, and I have regained access to my laptop of an evening (hurrah!). To offset this I have a bit of fabric fettling in between marking and decorating. 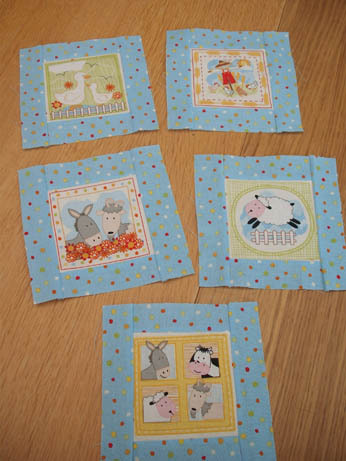 Have managed to work out what I am doing with the farm quilt despite a couple of ‘oops I have measured that bit wrong’ setbacks and have now put together all the labels with the spotty sashing – pic below shows 5 of the 12 that make up the quilt top. I am very much enjoying my adventures in quilting – we have a ‘Sit and Sew’ day next Saturday where as the name suggests we shall spend all day sewing so I hope to have the quilt top done and possibly backed and part quilted as well as it needs to be finished within a few weeks for a birthday gift. I like the way that as well as all of the free stuff when you register you can buy access to the individual shows you like without having to take out a yearly subscription and I think at about £1.50 a show that is very good value as they last an hour and are very informative.I watched a really good one on 1930s quilts the other day and am going to go back later and browse some more. Last but not least I have picked a winner for the 200th post – using a random number generator which other people have mentioned as good way of picking. I had five comments on the post so numbered them in order and the winner is Number 2 – Lorna (no blog). I am mailing you Lorna to ask you what you would like as your ornie. Thank you to all who commented and I will be having another one in a few months in Nov as that will be my 4th blogaversary! Well I hope that you have had better weather than we have – my Mum arrives next week for a visit so I am hoping that she will pack some Spanish sun in her case, meanwhile we will look on the bright side – at least I have got out of cutting the front hedge this weekend! See you next week with hopefully a completed quilt top, thanks for visiting.